Coffins used as street barricades in Cap-Haiten, Haiti. Photo by Ansel Herz / Mediahacker / The Rag Blog. 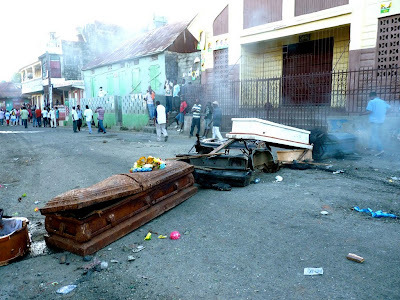 CAP-HAITIEN, Haiti -- The first barricade looked harmless enough. Foot-long rocks piled next to each other in a line. But as the bus driver slowed down, flying rocks landed in the street -- thrown by youths crouching in the bushes up the hill. MINUSTAH is the acronym for the UN peacekeeping mission. As I stepped off the bus, people standing at the road called me over and urged me not to go. It was the third day of so-called “cholera riots” against foreign troops blamed for introducing the disease into the country. Elizer and Duval were coming back home to Cap-Haitien. They were scared for me, saying under no circumstances should I talk with protesters or take photos. I reluctantly agreed to follow their instructions. I wondered if perhaps the UN peacekeeping mission was right in saying these protests were organized by a politician or gang. “Enemies of stability and democracy,” MINUSTAH mission head Edmond Mulet called them. So far, I’d only seen young men in the street. One teenager who threw a rock at us as we approached on motorcycle said, “pa gen pwoblem” -- no problem -- after I held out my press badge. As we arrived on the outskirts of Cap-Haitien proper, the streets were deserted except for people gathered around barricades. One was still flaming. At another, dozens of men milled around a burnt out car. I was glad when an elderly man walking in the street stopped me. I finally had a chance to do an interview, against the advice of my companions. I whipped out my audio recorder. He was Amos Ordena, the local section’s elected Kazek -- an official dispute mediator. Haitian street demonstrators want the UN's MINUSTUH troops to leave. Photo by Ansel Herz / Mediahacker / The Rag Blog. We finally turned off the main road and walked into an alleyway. Elizer’s modest home was at the end (he lost his wife, children, and house in the capital in the earthquake). One of his brothers, blind and handicapped, lay on the floor beneath a television showing a soccer match. He smiled and introduced himself when I walked in. Johnny and I hopped on a motorcycle taxi, taking backstreets to bypass the barricades. We passed a five-foot deep trench dug in a narrow dirt road. Johnny said a MINUSTAH vehicle fell into the trench Wednesday and people threw bottles at them. The troops opened fire, killing an innocent bystander whose body was taken downtown, he said. He doesn’t use that adjective to describe the actions of UN troops, accused of killing at least three demonstrators since Monday. As I walked towards the downtown’s central public square on Wednesday, finally nearing the house, I saw several dozen people facing Haitian police in full riot gear standing in their way. They said they had no beef with foreigners generally -- only MINUSTAH. Theodore Joel said they respected the Haitian police, because they’re brothers and family -- though two police stations were reportedly set on fire during the first day of protests. Thursday marked 203 years since the Battle of Vertières, where Jean-Jacques Dessalines led the final major assault on French armies to drive them off Haitian soil. They renamed the city: from Cap Francois to Cap-Haitien. I’m asking everyone I meet here -- from local journalists, vendors, men at the barricades, to a local magistrate -- if these protests were organized by a gang or political group. The unanimous answer is no -- people are fed up with UN peacekeepers and the cholera outbreak is the straw that broke the camel’s back. The magistrate said he understands and respects the people demonstrating, but he wishes the barricades weren’t impeding the transportation of medical supplies to fight cholera in his commune, where people are dying in the street. 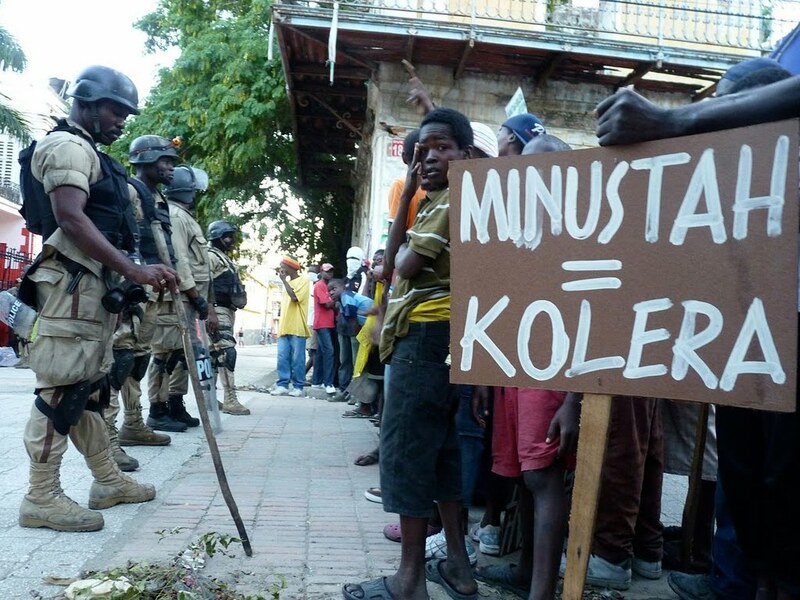 As the head of MINUSTAH warned that “every second lost” because of protests means more suffering and death from cholera, the anti-UN demonstrations continued in Port-au-Prince on Thursday. UN troops and Haitian police fired at least 30 tear gas canisters into the Faculty of Ethnologie and surrounding tent camps, the report said, sending children and old women fleeing into the streets. Police ignored the group’s pleas to stop firing. But most Haitians I’ve spoken with say no. They say this is the inevitable outcome when troops who operate in Haiti with seeming impunity may have introduced a deadly, misery-multiplying disease into the country. It’s an angry, popular movement -- protesting however they can, emotions running high -- against a five-year-old foreign occupation. Listen to Ansel Herz speaking about the protests on Democracy Now! 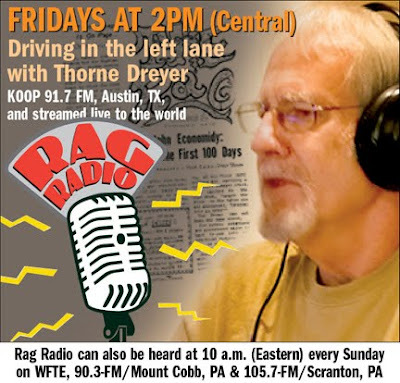 and Flashpoints Radio. Read Landon Yarrington’s account of how the protests began, which the magistrate disputes. And see Ansel Herz's earlier posts from Haiti on The Rag Blog.